Larry Summers believes we could possibly at the most dangerous moment since the financial crisis began. There are calls from others for another stimulus package. I do not like another stimulus package because it a transfer payment that is just a band-aid. Larry, calls for several options, one of which is makes for propping up the economy through infrastructure investment. The idea is that it will spur new job growh (especially in construction sector). I like the idea of infrastructure investment, and to be specific the Federal Government should invest in public transport infrastructure (trains, subways, mono-rails) across cities. With as prices on the rise and existing public transit not designed to handle the increased traffic, the secondary effects of improving or install mass transit systems are much more than any other infrastructure projects. There is precedence to such investment, it is the Interstate Highway network that propped up the economy in the past. The problems with any Government investment is, one how to fund it and second the risk of inflation. To first one can be addressed by increasing the gas tax (which is bound to have secondary negative effects on the economy and inflation). But in the long run we would have effectively addressed the energy crisis, reduced urban sprawl, and changed people behavior. So if the Government wants to help the economy, put it on a train (an electric one). The GDP numbers for 08Q1 was revised to show a 0.8% growth instead of the 0.6% growth. But the growth components still do not show healthy growth. We are not in a recession by the NBER definition, but the higher expectation among consumers for a faster price increase and the anemic growth point to a worser condition, stagflation. The average sales per restaurant has remained constant over this period. An average meals consumed outside the home per person increased as well. The current economic slowdown will lead to people cutting their additional meals outside home. An average restaurant that saw near zero growth will now see its sales drop. With increase in marginal costs due to food prices increase and the increase in operational costs, restaurants are getting squeezed from revenue side and the cost side. For franchise owners, there is no relief from the franchise fees despite falling sales and rising costs since the franchisees pay a percentage of the sales. 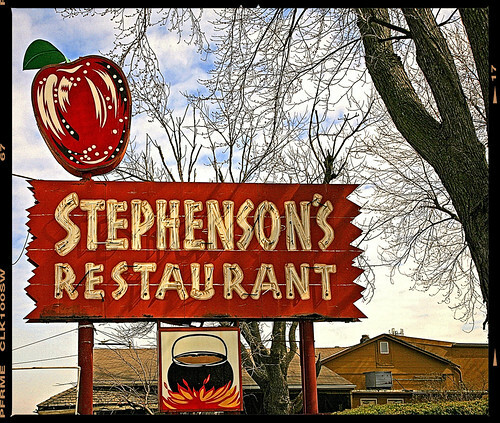 For family owned and operated restaurants, the impact is going to be worse, since the costs are much higher and the operations are geographically concentrated. I wonder if Go Local campaign has any economic merit. I wonder if it is really fair for the very locals the campaign targets to help. Why should you pay a higher cost to buy local when the market offers a lower price in places that are “non local” and products that are “non local”? Do we know for sure that the value creation (environment, labor, community impact) are all demonstrably higher with local vs. non local? Why pay for the inefficiencies of a local store or producer? If Wal Mart squeezes out the inefficiencies to provide customers with lower cost, would it simply not be better to take capture the added value? Do you stop at goods and services for local? How about ideas? Should you listen to and cultivate only the local thought leaders? What does it mean when a bookstore says Buy Local? Should people only read books written by local authors and printed using paper produced from local trees by local paper companies and sold in local bookstores? What about the locals who work in chains? Is it fair to deny them their right to earn a living by working in a place that offers them the best value? National Debt Ceiling – Raise the Roof? One logical way would be to cut spendings on one front to fund the new spendings or another way is to increase tax collection. There is a third way that countries like Zimbabwe practice, print money but the ensuing hyperinflation causes major havoc to the economy than the short term benefits. Besides, in most countries only the Central bank and not the Government can print money and more and more we see fairly independent Central banks. So this leaves the Government one most obvious way, Deficit funding. National Debt is what a Government or the nation has borrowed to fund its investments and operations. The debt, issued as bonds (e.g., T-bills) are either owned by the citizens or internationals (individuals, Governments and Central banks). For a common scale, the national debt is represented as a percentage of GDP. Why does the limit matter? The debt is not free, there are interest payments and a considerable part of the national income goes towards debt servicing. With no limits on debt accruals a populist Government can run u debt to fund its pet projects. A nation’s credit worthiness is also related to the debt it carries. So a nation with higher debt percentages may have to pay higher risk premiums on their interest rates. 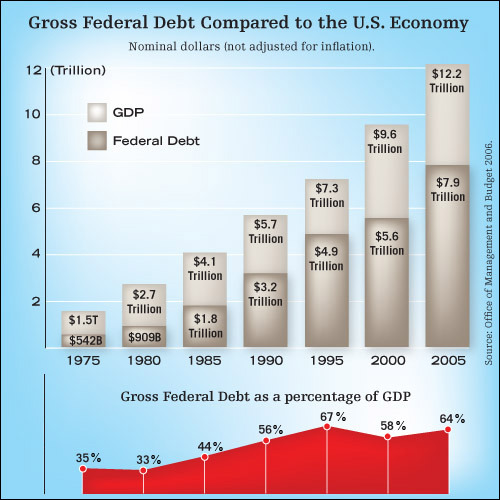 A large national debt also limits the Government’s moves to stimulate the economy through deficit funding. How does this compare to other countries? China, the major trading partner of US has a national debt of 17%. The EU countries have a Stability and Growth pact that requires the national debt of member countries to be less than 60%. In practice however this is not strictly followed as some of the members like Italy have 75% debt. The worst performer among the large economies is Japan with 160% national debt. The question is, how far will the US treasury secretary and the Congress would go given the recessionary environment. McCain, Obama or Hillary are being handed a problem more difficult than the National Security issue. Not everything that counts can be counted ... but did you try?